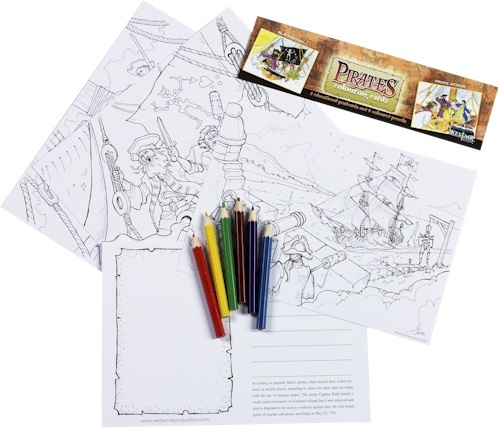 The Pirates Colouring Postcards consists of four A5 size colouring cards and six colouring pencils. There is a colourful header card and all are held in a clear cellophane bag. On the front of the cards are the images with the themes of the pirate Blackbeard, pirate attack, a lucky escape, buried treasure. On the reverse of each card there is an area to write a message and an area to put a stamp and an address. There is also education relating to each card.